‘Every family is a ghost story …’ As a child, Charley Benetto was told by his father, ‘You can be a mama’s boy or a daddy’s boy, but you can’t be both.’ So he chooses his father, only to see him disappear when Charley is on the verge of adolescence. Decades later, Charley is a broken man. His life has been destroyed by alcohol and regret. He loses his job. He leaves his family. He hits rock bottom after discovering he won’t be invited to his only daughter’s wedding. And he decides to take his own life. Charley makes a midnight ride to his small hometown: his final journey. But as he staggers into his old house, he makes an astonishing discovery. His mother – who died eight years earlier – is there, and welcomes Charley home as if nothing had ever happened. What follows is the one seemingly ordinary day so many of us yearn for: a chance to make good with a lost parent, to explain the family secrets and to seek forgiveness. Having read and enjoyed 5 People You Meet in Heaven by the same author I had high hopes for this book- enough that I was worried it would never meet up to my expectations. I was not disappointed. This book was beautiful, I think that is the only word for it. Short but sweet, and in a way I think it would have lost some of it’s charm if it was longer- it would have been overly complicated. The narative, despite it’s strange topic was somehow believable and written in a way that you could actually hear Charley talking. Despite the tough topic of someone you loving dying this story managed to be, maybe not happy, but hopeful. It left me thoughtful and contented. 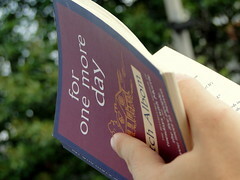 Did you read “tuesdays with morrie”? It is really sad because it is a true story. I like the style and the questionning. His books are generally one of those that makes you think of what is important in life, ect… I like this one and 5 people as well. It’s probably his most famous, isn’t it? And it’s on The Rory List, but I haven’t read it. I’ve read 5 People You Meet in Heaven though, and enjoyed that. I don’t know which one is the most famous to be honest. If you like five people you will probably like this one too. It is afterall the same sort of moral and leads you to think about life.